Kevin Jonas surprised his girlfriend Danielle Deleasa by showing up at her doorstep in New Jersey early Wednesday morning and dropping down to his knee to ask her to marry him. Presented with a cushion-cut diamond ring that Jonas designed with Jacob & Co., Deleasa couldn’t believe what was happening. Then, “She said yes, yes, yes like 500 times super fast in a row,” the oldest of the Jonas Brothers tells PEOPLE exclusively. Jonas, 21, and Deleasa, 22, who met in May of 2007 while vacationing with their families in the Bahamas, haven’t set a wedding date yet. “It still feels like a dream,” she tells PEOPLE. When Deleasa, a former hairdresser, first met Jonas two years ago, she admits, “I didn’t know who the Jonas Brothers were.” It was Kevin who eagerly pursued her after meeting her and then spotting her walking on the beach with a flower in her hair. Jonas popped the question after arriving in New Jersey on an overnight flight from a concert in Vancouver. “It was tough performing last night, knowing that I was going to ask the biggest question in my life to the most amazing girl in the world,” he says. And while the news is bound to break a lot of young girls’ hearts, the Jonas family couldn’t be happier. 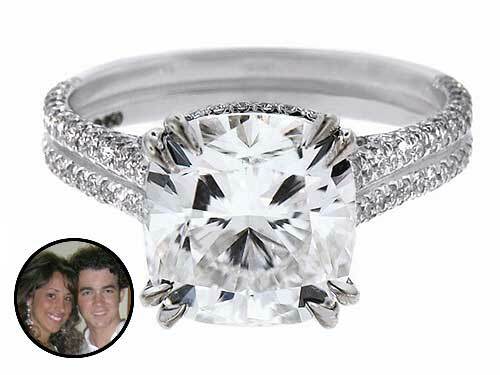 Exclusive Details: Kevin Jonas’s Engagement Ring for Danielle Deleasa Revealed!!! Yesterday, tweens everywhere lost a Jonas Brother (at least it was only Kevin), and Twitter did what Twitter does—addressed the breaking news with plenty of exclamation marks. Naturally, the obligatory “congrats!! !” came from the boys’ peers Miley, Demi Lovato and Jordin Sparks. So it was up to the more seasoned Twitterers to address this weighty situation properly. And Diablo Cody celebrated the event with a zing: “Kevin Jonas is engaged! Next: Nick Jonas gets engaged way better.” Hey-o! And finally, everyone needs to take like two minutes out of their day and tweet Lindsay Lohan a “Happy Birthday.” The poor birthday girl was missing a special someone right before she officially turned 23 at midnight, and then Zoe Kravitz had to beg the Twitterverse to send Linds birthday wishes. So do it! Lindsay needs our attention/help!